Why Should Seniors Choose A Safe Step Stool? If you are considering buying a safe step stool for your senior there are several special needs that MUST be addressed. Most seniors have less than perfect vision, right? Some are overweight and/or might not have the strength to get up on the step stool if it is too high for them to step up to, especially if they have recently had surgery. 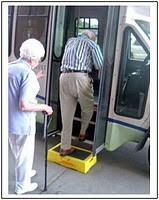 Directors of independent retirement communities and assisted living communities are aware that the special needs of seniors must be addressed when using a step stool to help their residents enter and disembark a bus. The directors don’t like step stools that have legs because when entering a bus the senior can mistakenly put their foot under the step stool, loose their balance and fall. The solution is a step stool that has a perimeter wall, like a box and the color of the step stool is bright enough for the senior to see. This allows the visually impaired senior to slide their foot to the step stool, and when they feel their toe touch the side of the step, raise their foot up and safely set it on top of the step stool. The height of the step stool is also very important! Physically challenged seniors cannot lift their foot more than about 5-7 inches. Make sure that the step stool you buy is within this range for ease of use to the senior. The average weight of Americans is getting heavier; this is no different with seniors, so be sure to check for a minimum load rating on the step stool of 500 pounds. This will ensure that your senior is safe when boarding a bus or getting into bed or whatever the need is for their step stool. One last feature that you should be aware of is the top surface of the step stool. 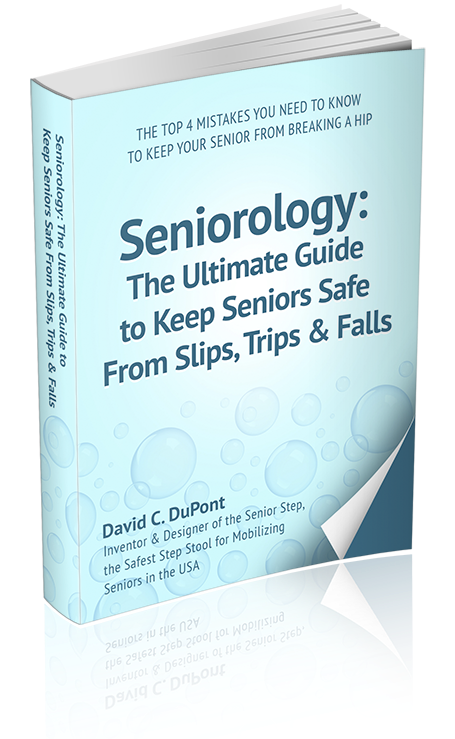 Is it large enough for a senior to stand on safely and does it have a non-slip surface designed to prevent your senior from slipping or sliding in wet weather? There are a lot of step stools in the market today claiming to be the best on the market. You can find different types of step stools from folding step stools and you can even choose from plastic, wooden or metal step stools. If you have a tight budget, you might be tempted to choose one of the cheaper step stools. Some of these step stools claim to have the best features and promise to work the best for you. But, how do you know which one to pick for a senior or loved elder? Simply follow the guidelines in this article and you’ll be sure to have the best step stool for your seniors. One question you should always ask yourself when buying a step stool for a senior is “If I were physically weak with poor vision, would I feel safe using this step stool for this purpose”. Before you ever let a senior use a step stool, stand on it your self and test it. You’ll be glad you did! David DuPont’s Shurestep step stool has been trusted and respected by different award giving bodies and institution. It has been invented to help solve problems with safety as its main concern. You can check for yourself all the products on his site www.shure-step.com. Enjoy your visit!